We’ve been discussing the US solar industry in the last few weeks here on the Greenstream blog, wondering about the impact of climate change denier Trump’s election. Recent statistics, due to be published 9th March by GTM Research and the Solar Energy Industries’ Association indicate that the current solar industry in the US is at an all time high and only set to increase, Presidential denial notwithstanding. The US solar market had its biggest year to date in 2016, doubling its annual record at total installations of 14,626 megawatts. 22 states each added more than 100 megawatts. Minnesota and Massachusetts led the community solar record, while most of the growth was due to an increase in utility-scale solar as it becomes ever more cost competitive with fossil fuels. Solar accounted for 39% of all new additions across all fuel types. This makes the US, for the first time ever, the number one source of solar generation. Small surprise then that our bestselling Solar Electricity Handbook consistently tops the US solar chart! Traditionally, it has rarely made economic sense to install a solar electric system for this purpose. This has changed over the past three years, with the availability of financial assistance in many parts of the world. If you are considering installing a system purely on environmental grounds, make sure that what you are installing actually does make a difference to the environment. If you are planning to sell back electricity to the utility grids during the day, then unless peak demand for electricity in your area coincides with the times your solar system is generating electricity, you are actually unlikely to be making any real difference whatsoever. A solar energy system in the southern states of America can make a difference to the environment, as peak demand for electricity tends to be when the sun is shining and everyone is running air conditioning units. A grid-tie solar energy system in the United Kingdom is unlikely to make a real difference to the environment unless you are using the electricity yourself or you live in an industrial area where there is high demand for electricity during the day. If you are in the United Kingdom or Canada and are installing a solar energy system for the primary motive of reducing your carbon impact, a grid fallback system is the most environmentally friendly solution. In this scenario, you do not export energy back to the grid, but store it and use it yourself. When the batteries have run down, your power supply switches back to the grid. There is more information on this configuration later in this chapter. There may be other factors that make solar energy useful. For example, ensuring an electrical supply in an area with frequent power cuts, using the solar system in conjunction with an electric car, or for environmental reasons where the environmental benefits of the system have been properly assessed. One of the benefits of building a system to work in conjunction with a conventional power supply is that you can take it step by step, implementing a small system and growing it when finances allow. As outlined in chapter three of my bestselling title, the Solar Electricity Handbook, there are three ways to build a solar electric system in conjunction with the grid: a grid-tie system, a grid interactive system and grid fallback. You can choose to link your solar array into the grid as a grid-tied system if you wish, so that you supply electricity to the grid when your solar array is generating the majority of its electricity and you use the grid as your battery. It is worth noting that if there is a power cut in your area, your solar electric system will be switched off as a safety precaution, which means you will not be able to use the power from your solar electric system to run your home, should there be a power cut. Alternatively, you can design a stand-alone solar electric system to run some of your circuits in your house, either at grid-level AC voltage or on a DC low-voltage system. Lighting is a popular circuit to choose, as it is a relatively low demand circuit to start with. As a third alternative, you can wire your solar electric system to run some or all of the circuits in your house, but use an AC relay to switch between your solar electric system when power is available, and electricity from the grid when your battery levels drop too low. In other words, you are using the grid as a power backup, should your solar electric system not provide enough power. This setup is known as a grid fallback system. Grid fallback and grid failover are both often overlooked as a configuration for solar power. Both these systems provide AC power to a building alongside the normal electricity supply and provide the benefit of continued power availability in the case of a power cut. For smaller systems, a solar electric emergency power system can be cost-competitive with installing an emergency power generator and uninterruptable power supplies. A solar electric emergency power system also has the benefit of providing power all of the time, thereby reducing ongoing electricity bills as well as providing power backup. The difference between a grid fallback system and a grid failover system is in the configuration of the system. A grid fallback system provides solar power for as much of the time as possible, only switching back to the grid when the batteries are flat. A grid failover system cuts in when there is a power cut. Most backup power systems provide limited power to help tide premises over a short-term power cut of 24 hours or less. Typically, a backup power system would provide lighting, enough electricity to run a heating system and enough electricity for a few essential devices. As with all other solar projects, you must start with a project scope. An example scope for a backup power project in a small business could be to provide electricity for lighting and for four PCs and to run the gas central heating for a maximum of one day in the event of a power failure. If your premises have a number of appliances that have a high-energy use, such as open fridges and freezer units, for example, it is probably not cost-effective to use solar power for a backup power source. In this above diagram, a second consumer box has been wired into the electrical system, with power feeds from both the main consumer box and an inverter connected to a solar system. Switching between the two power feeds is an automatic transfer box. If you are configuring this system to be a grid fallback system, this transfer box is configured to take power from the solar system when it is available, but then switches back to grid-sourced electricity if the batteries on the solar system have run down. This provides a backup for critical power when the normal electricity supply is not available, but also uses the power from the solar system to run your devices when this is available. If you are configuring this system to be a grid failover system, the transfer box is configured to take power from the normal electricity supply when it is available, but then switches to power from the solar system if it is not. One issue with this system is that when the transfer box switches between one power source and the other, there may be a very short loss of power of around 1/20 of a second. This will cause lights to flicker momentarily, and in some cases may reset electronic equipment such as computers, TVs and DVD players. Many modern transfer boxes transfer power so quickly that this is not a problem. However, if you do experience this problem it can be resolved by installing a small uninterruptable power supply (UPS) on any equipment affected in this way. Renewable energy has been the sensible and increasingly cost-effective choice for homeowners and corporations for quite some time, a far cry from the days of renewable energy projects in the developed world being the preserve of end-of-world conspiracy theorists and hippies. Yet since the inauguration of President Trump – who stated in 2015 that renewable energy was ‘just an expensive way of making the tree-huggers feel good about themselves’ – renewables may become a counter-culture choice once again, as Trump makes climate change denial the official stance and attempts to suppress the voices of those who claim otherwise. Renewables are radical once more. Let’s hope they’re right. Meanwhile, Trump moves forward on tossing out Obama’s Clean Power Plan and cutting longstanding tax subsidies…. The word ‘Chernobyl’ is hardly synonymous with safe and sustainable renewable energy. After the 1986 disaster that resulted in 50 direct deaths and up to 4,000 fatalities from the nuclear fallout, the site of the world’s largest nuclear disaster has been a no-go zone for years, emitting radiation that travelled as far as Wales. Yet times have changed, and two companies from China are aiming to make this part of the Ukraine home to a one-gigawatt solar power plant covering 2,500 hectacres just south of the Chernobyl plant. Ukrainian officials have stated that $1 billion is expected to be spent on the project over the next two years by the Chinese subsidiaries of Golden Concord Holdings (one of Chinas biggest renewables concerns) and Sinomach. GLC statework on the plant will start sometime this year. Ukrainian minister of the environment Ostap Semerak, believes the site is more than suitable for the project, offering ‘cheap land’ and ‘abundant sunlight’. It could be a new, bright future for Chernobyl, rebuilding the local community and perhaps is a fitting tribute to those who suffered as a result of the disaster. Directly or indirectly, all power on earth comes from the sun. The power of the sun is immense – every square metre of sunlight to fall on the earth provides the equivalent of 1kW of power. This power can be harnessed in several ways, with varying amounts of efficiency. For micro generation, the most common ways to harness this power is through solar hot water heating, solar electricity generation and ground source heat. In order to use solar power, you need a site with a lot of direct sunlight, a south facing location with little or no shade. Solar hot water is one of the most efficient ways of generating power, with modern solar hot water systems converting between 50-75% of the sun’s power into heat. Solar panels heat up fluids which are then run through a heat transfer unit to heat up water for use in your home. During the summer months, a solar hot water system can provide enough hot water to provide all the hot water a typical household will need. During the rest of the year, solar hot water supplements the existing hot water system. 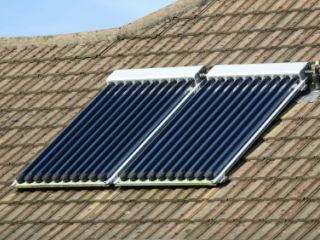 Typically, a solar hot water system can save £50-80 a year on the cost of heating hot water for a typical family home. Solar PV electricity panels have traditionally not been as popular as solar hot water systems. However, with the falling costs of photovoltaic panels and the rising costs of energy bills, these are becoming more popular. Depending on the type of solar PV panel used, solar electricity can convert between 6% and 22% of the suns energy directly into sunlight. Solar PV panels typically generate electricity at either 12 volt or 24 volt. The power is typically stored in a battery and then either used with low voltage appliances, or inverted to 240 volts using a power inverter. A solar panel controller is used to stop the batteries from being overcharged. Thanks to their modular design and low voltage, Solar PV systems are easy to design and safe and simple to construct, which make them ideal for DIY projects. Are We On the Brink of a Solar Revolution? Are we on the brink of a solar revolution? Over the past couple of years, there have been some significant breakthroughs in solar energy, specifically in reducing production costs of solar. During this time, the cost of photovoltaic panels has dropped by around 25-30% each year and this price drop shows no sign of slowing down. In fact, if anything it is speeding up. A few companies have been working on more advanced amorphous panels that have much lower production costs. These have been in production for the past few months, with a cost point of around $0.60 per watt (about 40% cheaper than what we see today). Once production has ramped up, these manufacturers are saying they will be able to sell these panels for around one sixth of that cost. So what does this mean for solar power? Quite simply, it will become the cheapest means of generating electricity available. At a wholesale cost of $100 per kilowatt (as opposed to around $1,000 today) we could see solar being incorporated into almost anything. Self-charging mobile phones, MP3 players, netbooks and laptops would be standard and the cost of fitting solar power to homes would be so cheap it would offer a payback in only a few months, no matter where in the world you lived. Warehouses and factories would all have photovoltaic roof panels, generating most – if not all – the power they need to operate by themselves. Electric cars would all have photovoltaic roof panels, providing up to 3,000km (1,800 miles) of self-generating power every year. Power companies could set up new regional power stations in just a few weeks instead of the several years it takes now. The ability to generate electricity at an affordable price would be limited only by the amount of space you have. Got a big enough roof? You need never want for electricity again. The Solar Electricity Handbook is the world’s best selling book on solar electricity. If you are serious about solar power, you need this book.Assuming no previous experience with solar power, the Solar Electricity Handbook tells you what you need to know about installing solar energy. Available from all good booksellers around the world, The 2017 edition has even more information, bigger diagrams and the latest details about this exciting technology. Click here to read a preview and to buy the Solar Electricity Handbook today. Of course we still need some way of storing the energy produced so we can release it when we need it rather than just when the sun is shining, but nevertheless, this is an exciting opportunity. Incidentally, in terms of energy storage, I still have high hopes for ultra-capacitors, but as yet we have seen a lot of speculation and hype and very little in the way of practical usable products. Let’s just wait and see. In effect, solar has the potential to do two things in the next decade: decarbonise much of our electricity generation and make electricity so cheap that it is effectively free to use. This changes the whole dynamics of how we view and use power. If electricity is so cheap that it is effectively free, everything starts to change. How are you going to heat your home? Expensive gas or free electricity? Are you going to have a car with an internal combustion engine using expensive fuel, or an electric car with free fuel? If solar power becomes the cheapest way of generating electricity, businesses and individuals won’t choose solar “because it’s green” but “because it is so cheap, you’d be daft not to”. 29th December 2016 – Greenstream Publishing will publish its eleventh edition of the internationally bestselling guide to solar electricity and installing photovoltaic systems, the Solar Electricity Handbook. The title is written by Michael Boxwell, a leading environmental speaker who is the inventor of the leading Battery LITE, an innovative solar battery storage system. The paperback is priced at £19.99/$19.99 and available from all major retailers. Full color hardback and ebook editions will also be available. The Solar Electricity Handbook has consistently been the leading title in its subject since its first edition in 2009, outselling competitors all over the world and proving indispensable to solar installers, researchers, students and homeowners, providing an informative and practical guide to installing these energy saving and cost effective systems. The title is used worldwide as a university core reader and has been referenced in a recent White House paper on renewable energy. 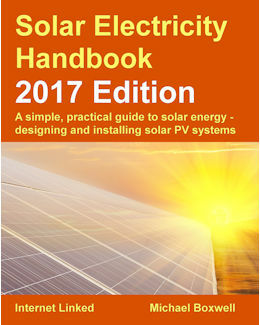 The web site that accompanies the book, found at http://www.SolarElectricityHandbook.com, is one of the most comprehensive free online resources for solar energy on the internet, featuring solar calculators and project tools to make solar energy projects as straightforward as possible. “The solar industry continues to evolve with new and improved technologies, particularly in the area of battery storage, and the 2017 edition reflects this. The solar industry remains a hugely exciting arena to work in.” Michael adds. Author Michael Boxwell is the inventor of the new Battery LITE battery storage system, a bestselling environmental technology author and an expert in the industry for fifteen years.